U.S. Sentate Endorses "National 9-1-1 Education Month"
Each of the groups is calling upon public safety officials, schools,government officials, and industry leaders to engage in a nationaleffort to educate children, seniors, and the general public about theimportance of and appropriate use of 9-1-1 services. During the monthof April, these organizations will conduct special outreach toencourage more 9-1-1 education. The groups praised the efforts ofSenator Clinton and Senator Stevens for their extraordinary bi-partisanleadership in passing the resolution. "An effective 9-1-1 is an essential part of any safe community,"said Senator Clinton, co-sponsor of the resolution and a co-chair ofthe E9-1-1 Congressional Caucus. "teaching children, parents, teachers,and senior citizens about 9-1-1 is one of the most important thingseveryone can do to help save lives and protect their communities. I amvery proud to join this national effort to advance 9-1-1 education forall Americans." "Teaching a young child on how and when to call 9-1-1 in anemergency situation can save your life," said Senator Stevens, (R-AK),"9-1-1 education should be standard in every pre-school and gradeschool." The U.S. House of Representatives approved a similar resolutionendorsing April National 9-1-1 Education Month on March 10, 2008. 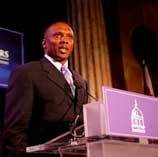 Retired NFL great Tim Brown, the national spokesperson for theCoalition, said: "the 9-1-1 system can save lives, but it requiresdedicated individuals who care about public safety to take the time toeducate a child or parent or teacher on how to use it." Brown said:"No effort to teach someone about 9-1-1 is too small. I want toencourage every parent, teacher, and public safety official to takesome time out during National 9-1-1 Education Month to make sure theirloved ones, students, and constituents understand the importance of9-1-1." "We can never do enough to educate the public about 9-1-1. Thecommitment of this impressive coalition of public safety and industryto dedicate time and effort to advance 9-1-1 education will help savelives and will produce a significant return on whatever effort ismade," said Gregory L. Rohde, Executive Director of the E9-1-1Institute. He said that "in addition to school-based activities, therecould be conferences and training events for parents, teachers,care-givers that bring together the public safety community andindustry leaders in a common effort." In today’s ever changing communications landscape, we cannotunderestimate the importance of better educating the public andmanaging public expectations about the 9-1-1 system. We are pleased tojoin all of these groups in support of this important resolution insupport of much needed increased 9-1-1 education efforts," said NENAPresident Jason Barbour. "NASNA looks forward to working with our communities in each of thestates to develop the materials and presentations that will be useful. This is part of our mission," said Richard Taylor, President of NASNA. "APCO is on the front lines of emergency calls every day," saidWanda McCarley, APCO President. "We think this is a tremendous ideaand we are very pleased to be a part of it." "The commercial wireless industry plays a uniquely important role intransmitting emergency calls, and helping public safety locate peopleneeding help," said CTIA President and CEO Steve Largent, "We supportthe effort to educate Americans about the value of 9-1-1 service andlook forward to continuing our collaborative efforts with the numerousdedicated organizations in the public safety community." "We are chartered to educate children on how to summon Public Safetyservices. This month will underscore that need and highlight theactivities to accomplish that end. It will also emphasize the overalleffort to educate all of our Nation in this vital task, properlycalling 911. 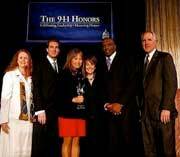 We are pleased and honored to be a part of thisundertaking," said Elise Kim, the Executive Director of 911 for Kids. "Modernizing 9-1-1 is the key to an overall informed emergencysystem," said David Aylward, Director of COMCARE Emergency ResponseAlliance, whose 100 organizational members advocate for advancedresponse using the latest technologies and procedures.